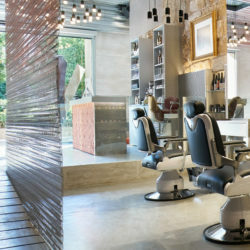 Located just off Palma’s main square in the heart of the city, the newest addition to the capital’s barbershop scene – Barber’s Club Palma – is also hands down the most conceptually striking. Before beginning, Alcúdia-based Minimal Studio had a clear objective: To create a space that fuses the traditional barbershop aesthetic with leading-edge design. The motif is first displayed literally, in the entrance where you are first welcomed by a large scale reproduction of the iconic barbary tool. A bar-style countertop also plays part of the customer’s arrival experience; a fine selection of whiskies and craft beers add to the relaxed mood of a private members club. Design elements echoing the ‘cut-throat’ razor include an emphasis on stainless steel, woven into panels that divide spaces and adorn walls. The ancient marès stone walls of the original building also feature heavily, juxtaposing the historical with the traditional and the 21st century. A softer patchwork of clay-coloured squares indeed have a tactile quality. As in any barbershop, lighting also plays an important role. The aim was for “completely direct lighting, but also an indirect atmosphere” which has been achieved through hanging lights positioned above each cutting chair, though encircling like a chandelier. The effect provides the necessary focus of lighting on the client, while creating a moody ambience in the rest of the interiors. Antique barber trappings and a vintage motorbike completes the marriage of traditional and contemporary. 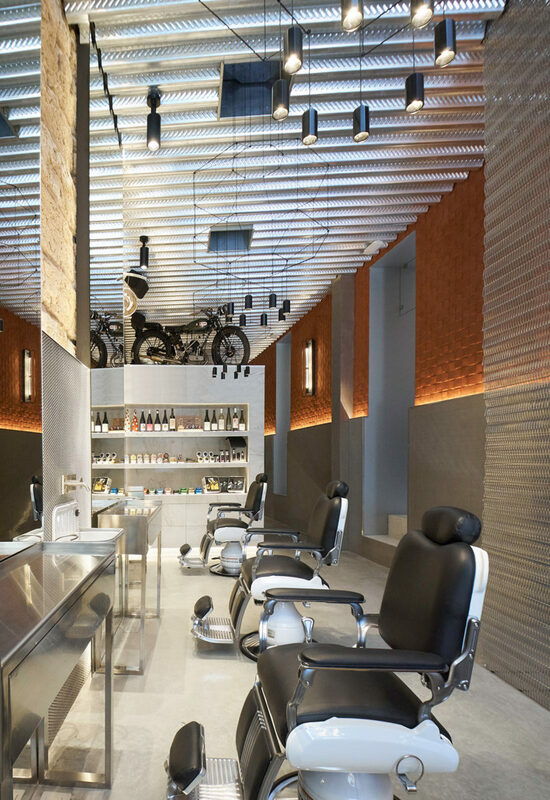 The result is a visually arresting space that combines razor-sharp modern design with the timeless tradition of the barbershop in an innovative and inviting space.